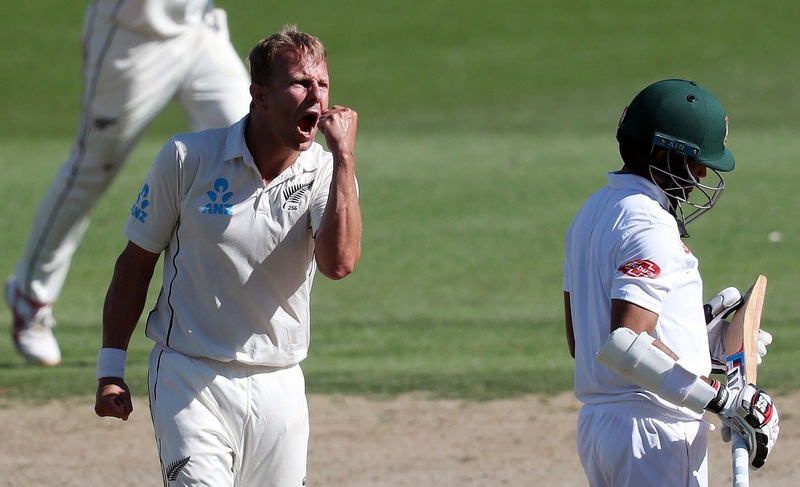 Bangladesh struggling to skip innings defeat as four quick wickets left Bangladesh in a troublesome position as they scored 174 for 4 at stumps on the third day of the first Test at Seddon Park in Hamilton. Bangladesh still trailed by 307 runs and they have six wickets in hand as need to bat six more sessions if they want to save this match which seems to be a quite difficult task. Though openers Tamim Iqbal and Shadman Islam got off to a solid start, in reply to the mountain of runs of 715- for 6 (dec) New Zealand scored in their first innings, contributing 88 runs for the opening stand but they lost their four top order batsmen rapidly in the span of 38 runs, leaving them in a deep trouble. Opener Tamim Iqbal, who scored magnificent century in the first innings, again shine with bat with a fluent 74-run off 86-ball before he was the victim of Tim Southee while his partner Shadman fell to Wagner after making 37. Earlier, Skipper Kane Williamson’s scored double ton as New Zealand declared their first innings at 715 for 6 in reply to a Bangladesh’s first innings total of 234. The Black Caps skipper Williamson was remained unbeaten on 200 as the Hosts took a massive 481-run first innings lead when they called the innings off midway through day three. Hard-hitting Colin de Grandhomme took New Zealand past their previous record score — 690 against Pakistan in 2014 — with a huge six, one of five in his tornado innings of unbeaten 76. For Williamson it has been an innings of milestones as the Black Caps skipper became the first batsman to score 20 Test centuries for his country. Wagner, who claimed five wickets in the Bangladesh’s first innings, finished with his Test-best 47 of which 42 runs came from boundaries — six fours and three sixes. His blistering innings finally came to an end when he was caught behind to give Ebadat Hossain his first Test wicket. After Bangladesh were bundled out for 234 in their first innings, the hosts batsmen pounded the bowling for two days. When resuming day three at 451 for four, Williamson was content to take a backseat as night watchman Neil Wagner blazed away contributing 47 runs — 42 from boundaries — in their 60-run stand.